A mysterious criminal mastermind has stolen one of the pyramids in Egypt, sparking a fit of jealous envy in evil genius Gru (Steve Carell), who hasn't managed to make headlines since he and his minions swiped the Times Square JumboTron years back. Ever since Gru was a little boy, he dreamed of going to the moon. Now, if Gru can just build a rocket and get his hands on a powerful shrink-ray, he can cement his reputation as the greatest thief who ever lived by stealing the Earth's satellite right out of the sky. But immediately after Gru heists the shrink-ray, the cunning super-nerd Vector (Jason Segel) swoops in and snatches it right out of his hands. Now, in order to claim the moon, Gru must first reacquire the weapon from Vector. Armed with the knowledge that his nemesis has a mean sweet tooth, Gru adopts cookie-selling orphans Margo (Miranda Cosgrove), Agnes (Elsie Fisher), and Edith (Dana Gaier) and commissions a new line of cookie robots from the evil Dr. Nefario (Russell Brand), his personal weapons specialist. 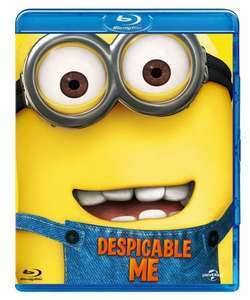 But as Gru and his diminutive yellow minions prepare to carry out the biggest heist in history, something strange happens. Gru discovers that the three little girls who have come into his life are much more than simple pawns. They actually seem to care about Gru, and it turns out the scheming evildoer makes a pretty good father. When Gru realizes that his upcoming moon mission clashes with a ballet performance by the girls, he must decide what's more important - being a present parent or cementing his nefarious reputation once and for all.